golf specialty shot making performance. The traditional way to start or improve your swing technique is through a swing learning and training programme comprising of lessons. From our experience and feedback on the learning and time management efficiency, lessons are usually spaced too far apart. The student will have lost the feel of the last lesson by the time he or she attends the next. There is no opportunity to experience the game as an integral whole. It can also become a chore to trudge down to the practice range with the mind still loaded with work. To some students the scheduled lessons may kill the total joy of learning golf. The sense of excitement generated by going to learn the comprehensive knowledge of the golf swing is itself a powerful motivating force to learn. It conjures up images of open air, exercise, adventure, fun and exclusivity. The absence of work sets the right mood to focus and learn. The participants get to learn all the fundamentals of the game in one go and get to see the inter-relationship of each skill. Even absolute beginners can get the opportunity to play on the golf course under the tutelage of teaching professionals and apply immediately what they have learnt. These are elements not feasible in an off-course swing learning and training programme. A side benefit of such a day intensive event is the bonding of the participants, enlarging your network of acquaintances, and making new friends. A One-Day golf clinic translates into more than 8 hours of golf lessons. The time efficiency is derived from not having to rush home. We are of the view that a One-day clinic program are the most effective way to create novice golfers. The golfers with playing experience will be grouped together to learn more in-depth on the swing technique, enhancing their short game plays and specialty shot making to see an immediate improvement in the shot making performances. The objective is to gear them to be a more competent golfer. The non-golfers will learn the golf swing technique in the range, chipping and putting and Rules of golf. On completion of the lessons, the non-golfers will have for the very first time played on the course, assisted and attended by our professionals. An experience that is very hard to come by. 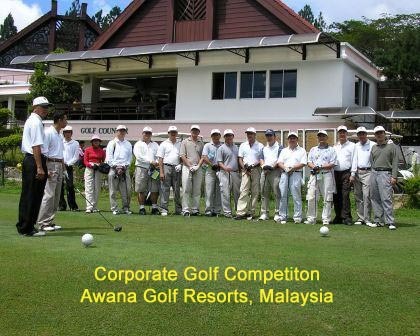 The participants will have acquired the patience, passion, technique and comprehension not only to see their real physical potential but fulfilling the perseverance and courage to be a proficient and complete golfer. Our requirement is that the participants arrive ready to work seriously for recreational fun and enjoyment. 2. Sharing their experiences with their friends. 3. Create a plan to start your golf aspiration. 4. Get a group friends to sign up together so as to defray the lesson fee. One weekday from 9am to 6pm. Weekdays availability is Tuesday to Friday. 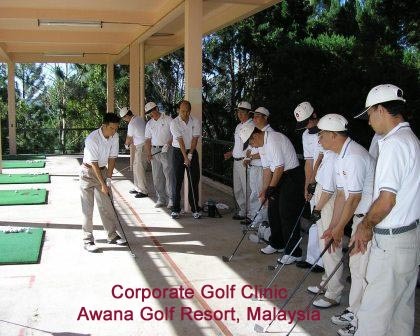 Selected golf course in Johor, Malaysia with practice range and facilities. We need 4 weeks advance confirmation for the booking of the golf course facilities. S$3,200.00 for a group of 8 participants learning together. Participants are required to use their own golf clubs during clinic lessons. Advance 2 weeks prior to the event's date for the booking of golf coach, practice range and course facilities.